Dimensions: W17.9" x H22.3" x D4.45"
Cover Your Cough (CYC) Compliance Kits hold an assortment of personal protection equipment in a convenient and attractive dispenser. Proper and consistent use of the products in this dispenser reduces the chances of spreading infectious bacteria and viruses, such as those found in influenza and the common cold. 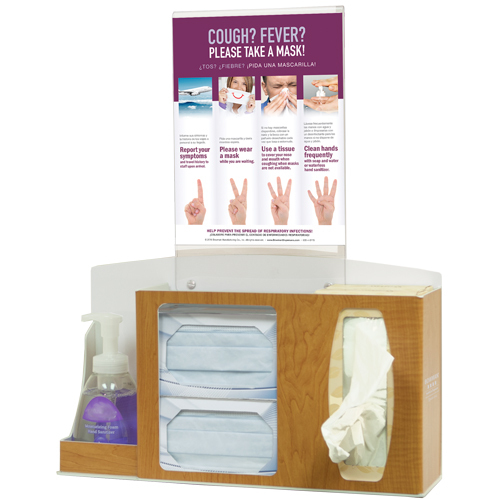 CYC Kits are ideal for use in public waiting areas, offices, and lobbies. This kit holds two boxes of earloop face masks, one – two boxes of facial tissue, and one hand sanitizer bottle or hand sanitizing wipe canister (consumables not included).